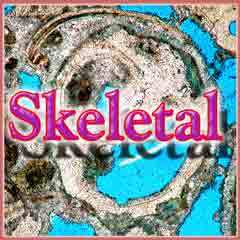 The skeletal parts of organisms are commonly composed of calcite, magnesian calcite, aragonite or opaline silica. This mineralogy determines the susceptibility of the skeletal fragment to diagenetic change and so its current composition and fabric in a limestone or dolomite. calcite skeletal grains, which contain less than 4 mole % magnesium in the calcite, include some foraminifera, brachiopods, bryozoans, trilobites, ostracodes, calcareous nannoplankton, and tintinnids. skeletal grains of magnesian calcite, that is with 4-20 mole % magnesium in the calcite, include those produced by echinoderms, most foraminifera, and red algae. Aragonite skeletal grains are formed from corals, stromatoporoids, most molluscs, green algae, and blue-green algae. 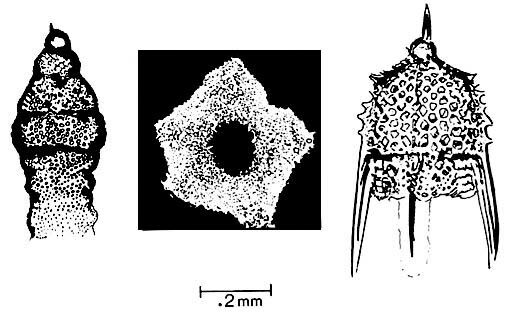 skeletal grains of biogenic opaline silica include sponge spicules and radiolarians. Foraminifera are one-celled animals that are free-floating (planktonic) or live on the sea floor (benthonic) and secrete a calcareous or agglutinated test that is commonly preserved unbroken. Foraminifera tests preserved in the sedimentary record are commonly used as indicators of water paleo-depth, paleotem perature, oceanic circulation, turbidity and age of the deposit. Planktonic foraminifera tests form reservoirs in the Cretaceous and Tertiary of the North Sea (the chalk reservoirs of Ekofisk Field are an example), and benthic foraminifera tests are responsible for hydrocarbon reservoirs in some porous carbonate sand deposits within the Permian basin (Late Paleozoic fusilinids) and offshore Tunisia (Tertiary Nummulites). Foraminifera tests display a wide variety of shapes and sizes, but most are less than 1mm in diameter (figure above). Most are multi-chambered and these chambers are arranged serially (uniserial, biserial or triserial) or are coiled (planispiral or conically spired). 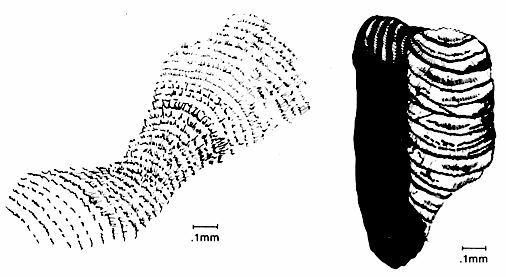 Recognition of wall structure is critical for the identification of foraminifera because random sections of specimens do not reveal all the chambers or their true shape. 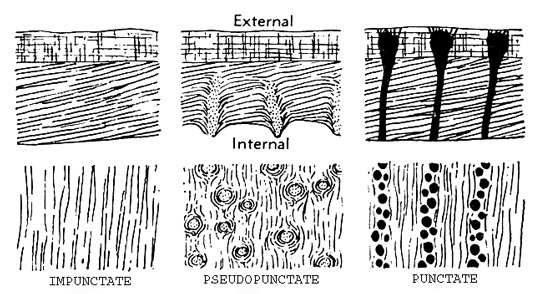 Unfortunately, the wall structure, especially in Paleozoic species, is often obscured or destroyed by diagenesis. Brachiopods are especially important contributors to the fossil record of Paleozoic shallow seas. The shells, which consist of two unequal valves or curved plates, are usually from 1 to 10 cm. in diameter. They are either inarticulate and composed of calcium phospate, or articulate and made of a chitinous periostracum covering thin outer prismatic and thick inner lammelar calcite layers. 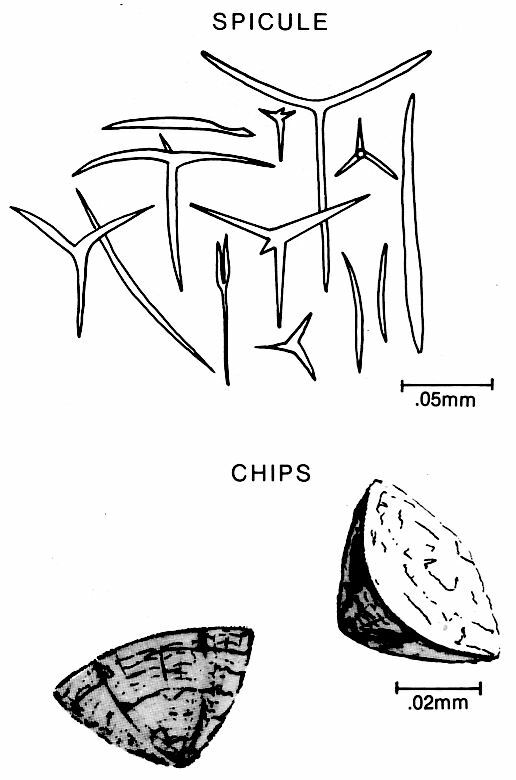 As shown to left, the shells may be (1) impunctate, (2) pseudopunctate with the inner shell layer embedded with rod-like plugs, or (3) punctate in which small rounded to elongate pores penetrate the shell. Some brachiopods, like the late Paleozoic productids, grew spines which, when broken, contribute separately to the sediment. Bryozoans are colonial benthic organisms with calcareous skeletons that are encrusting, branching or fenestrate (resembling a window screen). Their binding ability makes them especially important as contributors to the building framework in reef settings of all ages. 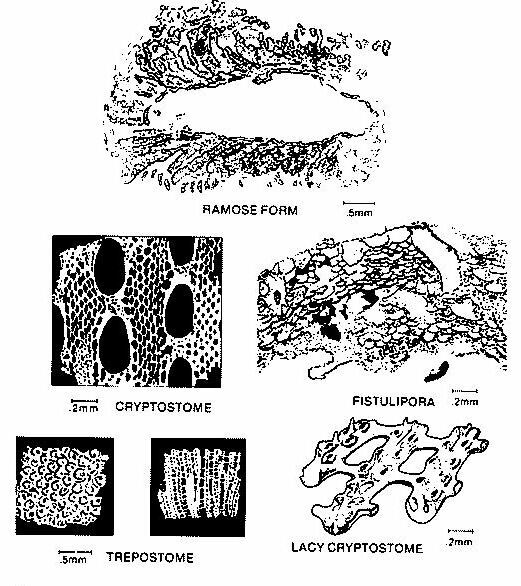 Their recognition and subdivision into classes is based primarily on wall structure and the arrangement of internal round or polygonal elongate tubes (zooecia) (left figure). laminated wall structure is a distinctive feature of bryozoan debris in thin section. Most bryozoans are calcitic, but some are partially or totally composed of aragonite. Trilobite shells are especially common as skeletal debris in Cambrian and Ordovician limestones. In cross section trilobite shells are long, sinuous and frequently have a recurved shepherds crook shape (left figure). Trilobite shells are generally less than 1mm thick. The shell may be a few centimeters long but they are formed of individual pieces that are millimeters or less in length. Their shell is composed of calcite crystals that are oriented perpendicular to the wall. However, when examined with a light microscope, the fabric appears to be homogeneous because the crystals are too small to be easily distinguished. The fabric exhibits undulose extinction under cross-polarized light. Ostracodes have two valves, usually less than 1 mm in diameter, that may be smooth or ornamented. The valves are joined along a hinge and overlap slightly, so that in section the shell is asymmetric (above figure). Some smooth-shelled forms have calcified projections on the shell that point inward. Although quite variable in microstructure, the shells usually have fine prismatic structure. Coccolithophorids are planktonic calcareous yellow-green algae that are a major contributor to Mesozoic and younger deep-sea sediments. Individuals consist of round coccospheres covered by coccoliths. Coccoliths are a valuable biostratigraphic marker of age and oceanic circulation in rocks that are Jurassic and younger in age and are the major component of chalk reservoirs. Commonly the coccoliths form elliptical discs that consist of an intricate arrangement of calcite crystals (above figure). A coccolith is usually less than .02mm in diameter, therefore under a light microscope little detail can be seen. Fossil nannoplankton also include the star-shaped discoasters. 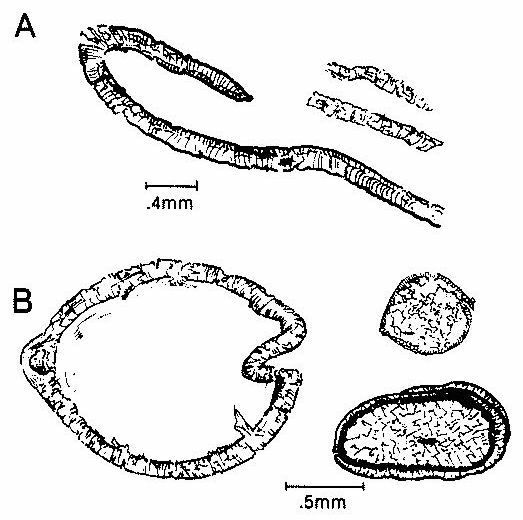 Tintinnids are pelagic protozoan that have a microscopic cup-shaped calcite test commonly .1 to .2 mm across (left figure). 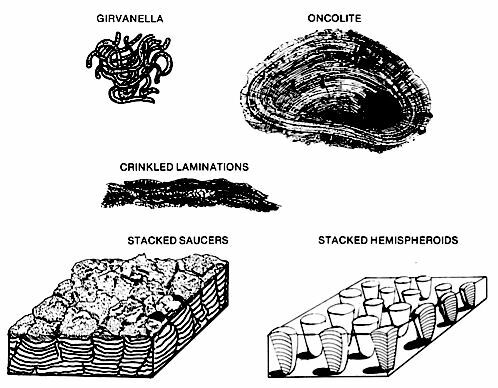 In thin section the tests have U-shaped longitudinal cross-sections and circular or elliptical transverse sections. Usually, the longitudinal sections have characteristic flanges at the opening of the test that create a horseshoe shape. 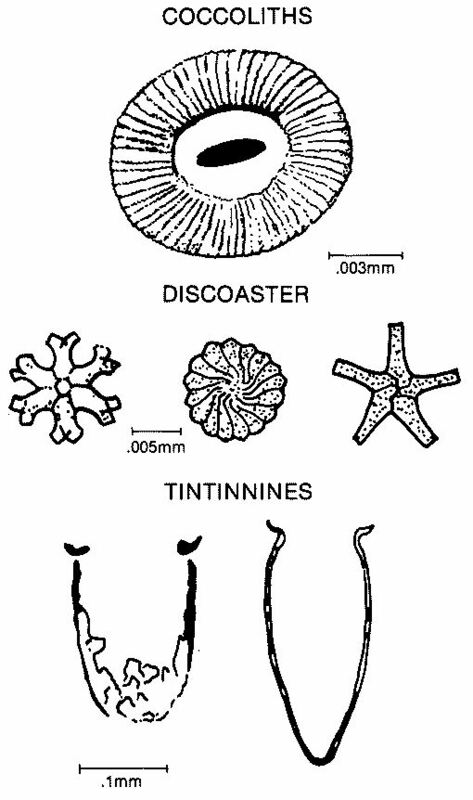 Tintinnids are very common in Upper Jurassic and Lower Cretaceous deep-water limestones of the Mediterranean region. Echinoderms today are composed of many individual magnesium calcite plates. The plate fragments and spines are scattered through the marine sediments of reefs, shallow shelves and deep-sea basins. Individual plates and spines from echinoid tests are easy to identify in thin section because the entire fragment extinguishes with cross-polarized light. The spines exhibit characteristic internal radial patterns (right figure). Holothurian spicules (ossicles) are also single crystals. They are small, .07 to .1mm, and occur in a variety of shapes. 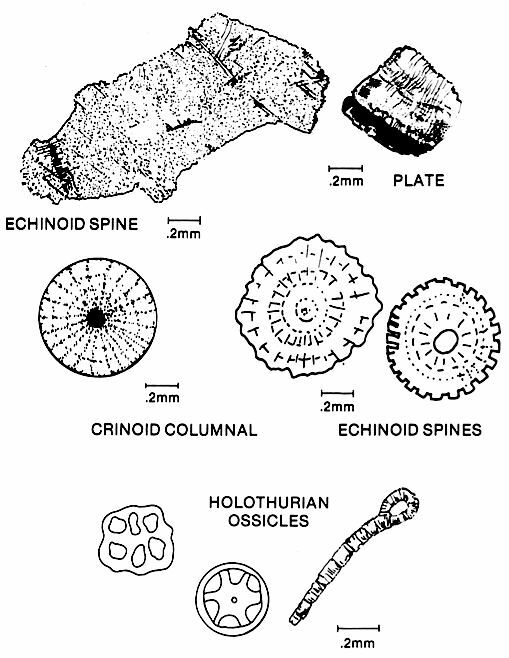 Ophiuroids and asteroids also contribute plates, spines and ossicles. In ancient limestones crinoid plates are easily distinguished in thin section by their reticulate pattern. Although these plates now have calcite mineralogy, they still behave as large single crystals. The plates usually appear dusty because the reticulate network of pores may be filled with micrite or inclusion-bearing cements. Pore filling or rims of cement on echinoderm plates are usually added in optical continuity. Red algae are calcified benthonic plants that occur as crusts, nodules and branches. Coralline red algae occur in a variety of growth forms. Some have articulated branches of cylindrical or flattened leaf-like segments and usually grow in sheltered environments. Others, which are encrusting or massive forms, grow on a variety of substrates within varied energy conditions. They form nodules on unstable sea bottoms and are important encrusters and cementers in modern coral reefs, particularly in the Pacific where algal ridges form a rim or lip to the reef. Red algae are important binders in reefs of all ages. They play an especially important role in Mesozoic buildups. Corallines can also be important in colder or deeper-water sediments. 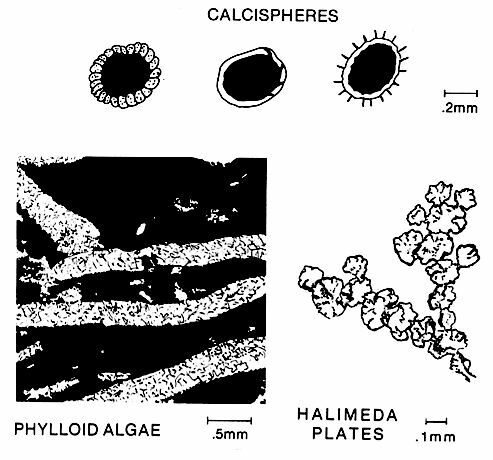 Depending on the orientation of the section with respect to the growth surface, the calcified thallus of the alga has either a characteristic rectangular or rounded cellular pattern (above figure). Smaller fragments, only a few millimeters in diameter, may be distinguished by the structure, type of conceptacles (cavities where spore-bearing cells collect) and detail of the calcified tissue. These magnesium calcite algal fragments can be micritized to form a dark brown opaque mass. Reef-building corals thrive in shallow warm waters of normal marine salinity, but tolerate a wide range of temperature and salinity. Corals can be important contributors to the growth of carbonate platform margins because of their rapid growth rates in reef settings and their ability to produce large amounts of sediment. Stony solitary or colonial corals have similar calcareous skeletons with basic skeletal elements of aragonite or calcite fibers. The fibers are grouped in sclerodermites that are aligned into trabeculae. The fibers are arranged somewhat differently in different parts of the coral, and some variation of fiber orientation exists between orders. The skeleton is characterized by an outer wall and by a series of internal vertical plates (septa), horizontal plates (tabula) and curved plates (dissepiments) (above figure). 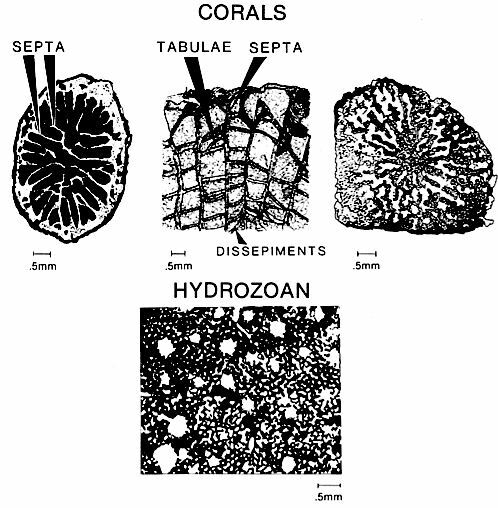 The patterns of internal plates and growth forms are used to identify the large variety of coral types. Alcyonarian corals, actually hydrozoans, are an exception in that they do not have massive skeletons but instead produce spicules. The spicules are varyingly shaped and range from 0.1 mm to 5 mm in length. Stromatoporoids are important reef formers in the Paleozoic and Mesozoic. They are possibly ancient equivalents of sclerosponges that coat ledges in the deeper parts of modern coral reefs. Apart from siliceous sponges the fossil skeleton is normally calcite, but their preservation in limestones suggests that they were originally aragonite. The skeleton consists either of overlapping dome-shaped, convex-outward plates or of a trelliswork of concentric laminae with various supports or pillars (right figure). In sections parallel to growth direction, the stromatoporoid skeleton has a rectangular grid pattern. Pelecypods and gastropods are the commonest mollusks. Rudists are probably the most important of the pelecypods to the exploration ist. Rudists formed carbonate banks (reefs) during the Cretaceous. These contain significant reservoirs in bank and associated rudist sand debris aprons. Pelecypods have two shells that are hinged along one margin, while gastropods are coiled tubes that can form a number of shapes (left figure). Three or more layers form typical shells: an outermost layer of chitinous periostracum and two inner calcareous layers. Layers commonly have a nacreous or cross-laminated microstructure, but up to six types of microstructures are possible. The appearance of each structure varies according to its orientation. Molluscs can be recognized by shell shape and their multilayered wall structures. Broken pieces of fine mollusk debris may not be recognized as such because the fragments are commonly leached and infilled or replaced by calcite spar. Mollusks inhabit nearly every marine environment. Shell growth is environmentally controlled; thin shells typify quiet-water or cold environments whereas thick shells occur in higher-energy environments. The shells are primarily aragonite or they may be a mixture of aragonite and calcite; thus, their manner of preservation is variable. In shells with mixed mineralogies, the outer layers are commonly calcitic and the inner layers are commonly aragonitic. Rudists represent a special case in that they underwent major changes in shell mineralogy and structure during the Cretaceous, involving an increase in the relative proportion of aragonite to calcite (and thus an increase in the likelihood of development of secondary porosity) and an increase in porosity and complexity of the shell. 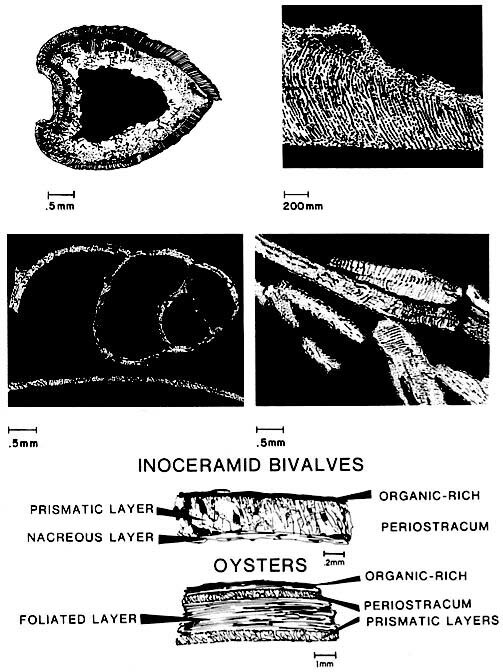 In contrast, oysters are shallow-marine benthic pelecypods having a three-layered calcite shell. Other pelecypods have similar mineralogy; an example is Inoceramus that is common to shelf and deep-shelf deposits of the Cretaceous. Green algae are important contributors to mud-and sand-size carbonate sediment. For instance, the phylloid or plate-like dasyclad algae Ivanovia contributed extensively to carbonate mound build-ups in the Mississippian and Pennsylvanian. Green algae are plants that precipitate carbonate in their flesh parts. They may be crustose, nodular growths or erect plants commonly formed of segmented, flattened or cylindrical branches (right figure). Green algae are distributed worldwide, principally in warm shallow seas. They are common in quiet lagoons, but are also found in less turbulent parts of open shelves and reefs. Calcispheres are small hollow spheres that may be fruiting bodies of certain green algae. The spheres apparently were extremely buoyant and tended to accumulate in quiet settings like intraplatform basins. Cyanobacteria or blue-green algae are most important as binders in tidal flat, lagoon and reef settings. Stromatolites are layered structures formed by cyanobacterai and carbonate sediment. They are commonly, but not exclusively, recognized in ancient carbonates that were deposited in tidal flat settings. Other blue-green structures include Girvanella, resembling an intestine-like mass of tubes (left figure), and Renalcis, a branching tree-like form. These forms are common in reefal cavities and some slope sediments of the lower Paleozoic. In Recent environments, the blue-greens form slimy mats composed of filaments and carbonate. The carbonate may be precipitated through photosynthesis or trapped as grains washed onto the mat. The cyanobacteria form colonies that may be recognized by their external form (above figure). They may be stacked hemispheroids or saucers, etc. The crinkly banding of an ancient algal colony is difficult to distinguish from soil concretions or caliche in section because all of these deposits exhibit horizontal banding, spherical growths and heads. Occasionally algae infest the surface of grains and form an envelope of micrite. This envelope represents an alteration or addition to the perimeter of the grain. The alteration replaces the organized grain fabric with disorganized micrite in two steps: (1) the boring activity of the algae with dissolution of the grain followed by (2) reprecipitation or trapping of calcium carbonate in the void. Sponges were extremely important as reef builders in the Permian and the Mesozoic. Other forms produce abundant sediment during bioerosion of reefs and other hard substrates. Most sponges live in water less than l00m deep on hard bottoms where there is some water circulation. Sponge spicules are commonly all that is preserved. These are composed of silica, but they may be calcite or spongin (right figure). Spicules vary in size and shape depending on their position within the sponge and their function as structural framework or as protection. Sponge spicules have smooth and simple geometrical shapes and a hollow central axis; in contrast, spicules of other organisms usually have a more complex shape. Sclerosponges are calcareous sponges that precipitate a massive aragonite skeleton and have siliceous spicules. These sponges are important contributors to the generation of deepwater reefs, living mainly in crevices and caves. Another important group of sponges are the boring varieties, such as Cliona, which produce large quantities of silt-size carbonate sediment that collects near reefs and on hard bottoms. The excavating cells of the sponge form characteristic hemispherical-shaped chips (above figure). Radiolarians are microscopic pelagic organisms that construct a test of opaline silica (figure below). 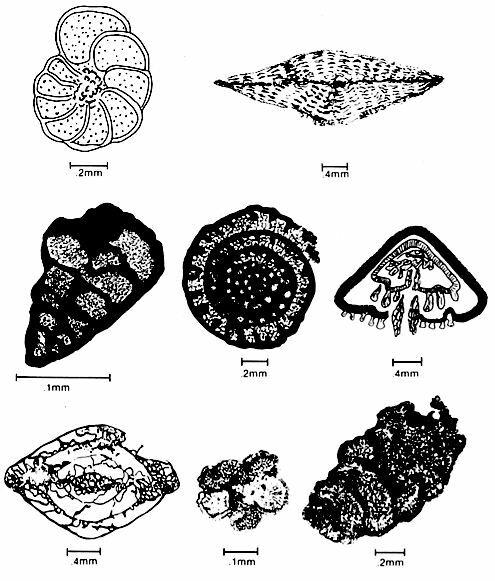 Their mineralogy ensures that the varieties of Radiolarian tests seen in left figure are preserved below depths at which carbonate grains dissolve. They can form thick widespread deposits over deep ocean bottoms or occur in silica-rich water associated with submarine volcanism. Radiolarians are an important biostratigraphic tool where they occur in deposits that commonly lack calcareous fossils. The radiolarian skeleton may be 2mm in diameter but is usually smaller. Skeletons vary greatly in shape and ornamentation. Often the shell is a hollow perforate sphere or vase. Most shells show low birefringence and fine-grained fibrous structure comparable with cherts or chalcedony. The porosity that characterizes the shells is usually occluded during this alteration.